Visit the first ever beer garden in America and try one of their 20 craft beers and ciders on rotation! Complementing the ever changing beer selection is a list of 20 burgers expertly paired to each draft beer. Clinton Hall is the perfect spot for when you’re hungry at happy hour! Looking for a beautiful sunset to pair with your favorite happy hour drink? Pier A has the finest views of the Hudson River equipt with a total of four bars! Don’t forget to check out their Oyster Bar for the ultimate after work snack. Located on Stone Street, Mad Dog and Beans is the ideal place to be when the weather is warm since the outdoor seating is bustling! They are best known for their authentic Tex Mex and Margarita pitchers. What more could you ask for? Visit the Financial District’s favorite rooftop bar to see breathtaking views of the Statue of Liberty, Hudson River and New York Harbor. You can sip on their signature cocktail, a fruity People’s Pop with an ice pop topped with chilled Prosecco or Rose, out on the rooftop terrace with taking in the gorgeous scenery. The Hideaway Seaport is a gastropub equipped with all beers crafted in New York. Enjoy their outside seating during the summer months to experience local beer and a rock and roll atmosphere for happy hour. Resting on the edge of Pier 15, Watermark is an ultra-modern double level bar equipped with picnic tables and open seating. Between the stunning views of Brooklyn and popular concerts it’s hard not to fall in love. Don’t miss out on this summer dream! Ever needed a 12 lb Moscow Mule after a long day at work? Look no further. 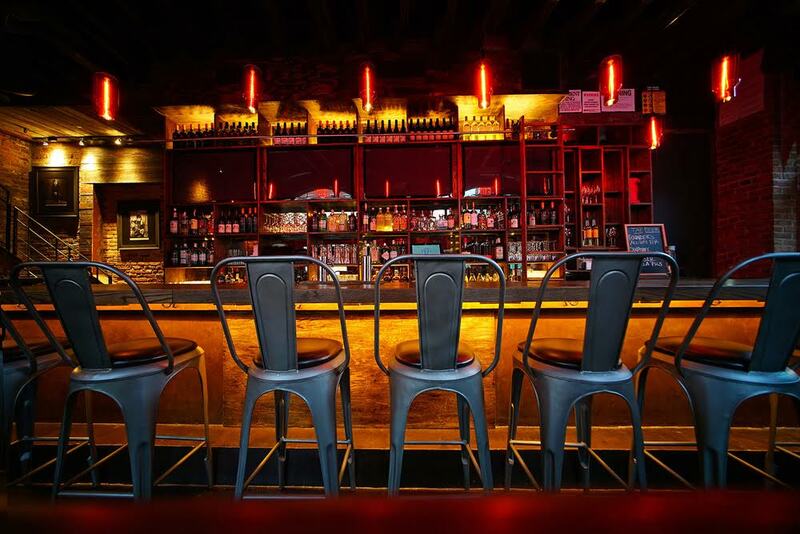 Broadstone Bar & Kitchen is a lively bar located on the corner of Broad and Stone Street (hence the name) and likely the most convenient bar on our list! You can find a variety of beer and cocktails from all over the world along with their famous 20 shot Moscow Mule! Find great happy hour deals from 4-7pm at Ketch Brewhouse, featuring a rooftop, terrace with outdoor dining, bars & lounges. Experience unique American cuisine and drinks in a setting perfect for any occasion! With views of the Brooklyn and Williamsburg Bridges, this is the place for an afternoon pick me up along the water. Industry Kitchen is largely popular around happy hour so don’t miss out on this great location! The Growler sits on historic Stone Street and showcases a wide variety of beer from all over the country. The Growler is known for their love of dogs so bring along your furry friend to enjoy the outdoor seating! Madeline is the Assistant Community Manager at both our Bond 55 Broadway & Bond 60 Broad locations. Originally from Northern New Jersey, Madeline attended High Point University in North Carolina and received her degree in Marketing and Sales. At Bond Collective, Madeline can be found at either of the Financial District locations combining her vast knowledge of Sales and Marketing with her passion for collaborative and hospitable environments. In her free time, Madeline is a seasoned snowboarder, but when not on the mountain, she can be found with a good book and burger. After a stint in the south Madeline is excited to be back north and to make Hoboken her new home! Interested in a Partnership with Bond Collective? At Bond Collective we value community and are always looking for ways to partner with businesses. Interested in partnering with Bond Collective or sponsoring an event at one of our locations? Email Lara Gould today.